This is an elementary level Hindi practice workbook. 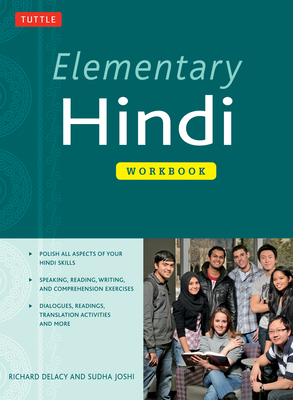 Intended as a companion to Elementary Hindi or as an independent study tool, this beginner Hindi workbook is the perfect guide for practicing and polishing your basic proficiency in the Hindi language and includes carefully crafted practice activities to read Hindi, write Hindi and speak Hindi. The variety of activities offers beginning level learners the range of practice opportunities they need. Translation exercises from Hindi into English and vice versa. Richard Delacy, PhD., teaches Hindi and Urdu at Harvard University. He is the author of Teach Yourself Beginner's Urdu Script (McGraw-Hill) and Hindi in a Flash (Tuttle). He travels to India frequently. Sudha Joshi received her MA in English literature in India and then taught Hindi in Melbourne, Australia at various universities for over fifteen years. She has produced numerous teaching materials and translated Hindi poetry into English for publication.